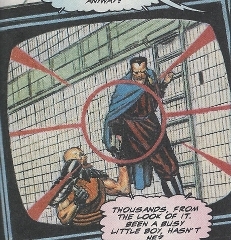 Powers: Damyish is a telepath, enabling him to read and, in some cases, influence the minds of others. This ability is inversely proportional to his distance from his target/subject; Damyish had to be within a few feet of a subject to read his or her mind. Damyish did not demonstrate any particular fighting skills, preferring to allow his bodyguard, Castonis, to do all of his fighting for him. Damyish had amassed a large amount of blackmail-type material against a number of key figures across the star system, allowing him to manipulate entire armies or governments in some cases. He kept his files stored in his Jamhook vault within his immense estate, which was defended by fighter ships and rockets. In some fashion, he has changed the color of his eyes, obscuring their otherwise gold irises. 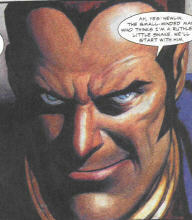 He also manages to shield his telepathic powers, even from other telepaths. (Starlord#1 (fb) - BTS) - Damyish was born a telepath in the Carinian Cluster, and would normally have been classified as one of the Probiti. However, under unknown circumstances, he managed to shield himself from detection, and grew to adulthood separate from the Probiti. He used his powers to his benefit at every opportunity, eventually becoming the Lawgiver of the colony planet Bovric. 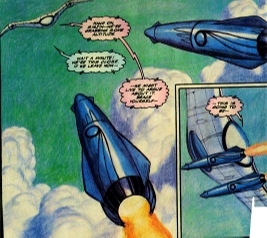 In addition, presumably aided by the use of his powers, he managed to accumulate a wealth of knowledge, materials, and documents with which he blackmailed a large number of powerful individuals and groups across the star system. (Starlord#1 (fb)-BTS) - Damyish kept his distance from the three Probiti stationed on Bovric, and made no secret of his disdain for them. When one of them died, some people suspected (and probably rightly so) that Damyish may have had a hand in it. 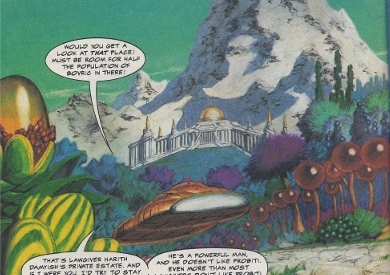 (Starlord#1) - Damyish was informed that the new Probiti, Sinjin Quarrel, was spending a significant amount of time in a certain part of the woods. He and Castonis investigated this and found the legendary Ship of Starlord. Sinjin, who had befriended Ship, posed as Starlord to drive them off, but not before he and Castonis could incapacitate and capture one of Ship's Widgets. (Starlord#2) - Starlord/Quarrel and Rora (as Quarrel had named her) retook the Widget, destroying a large portion of Damyish's estate in the process--the part that held most of Damyish's blackmail documents. Nonetheless, Damyish instituted his plan, using his forced (via blackmail) alliance with Viz Glazgon to recruit his powerful mercenary unit, the Iforani, to his side. 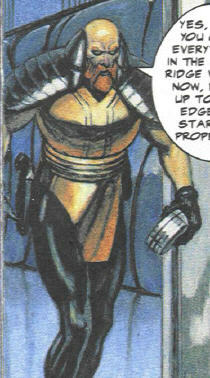 Damyish planned to use the army, assisted by his own telepathic power, to take over Carina Prime, home of the Probiti. (Starlord#2 - BTS) - As Starlord and Rora prepared to head to Holmrig and confront Glazgon, a number of Damyish's fighters -- the ones who had chased Rora off of Damyish's estate -- caught up to them and attacked. Converting into battle mode, Rora made short work of the fighters, destroying them all. (Starlord#3 (fb) - BTS) - Damyish made a deal with Glazgon to help him capture Starlord in exchange for the delivery of the files Damyish had been using to blackmail Glazgon. 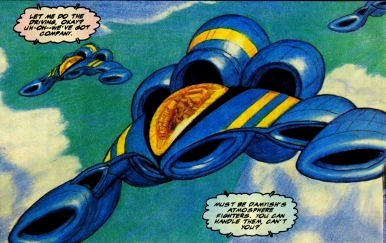 (Starlord#3) - Damyish met with Glazgon on the planet Holmrig, but they were interrupted by Ship and Quarrel (now fully in the role of Starlord). Damyish, however, correctly suspecting some link between Quarrel and Starlord (but not realizing they were now the same being), had taken Quarrel's parents hostage to prevent Starlord from attacking him. Starlord duped Castonis into destroying the last piece of evidence Damyish had against Glazgon, and thus ended their alliance. Glazgon then had Quarrel's parents released, and had Hamyish and Castonis sent to prison. Comments: Created by Timothy Zahn and Dan Lawlis. Starlord (Sinjin Quarrel) referred to his predecessor, Peter Quill, as being from "a minor planet called Earth," but further noted his was mobile throughout "the entire galaxy." Since Sinjin said "the galaxy," I'd think that meant he considered Earth to be in the same galaxy as the Carinian Cluster...which would make the Carinian Cluster in the Milky Way galaxy. Colonel Castonis deserves his own profile. Any takers? He was Damyish's chief aide. He was an expert marksman, and had hair trigger reflexes. He proved capable of blasting one of Ship's Widgets right out of the air. Later, however, Ship used that trait against him, by sending Damyish's evidence against Glazgon flying through the window, knowing he would blast it. 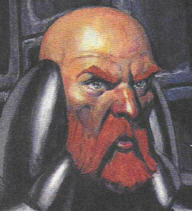 He was sent to prison on Holmrig alongside Damyish. 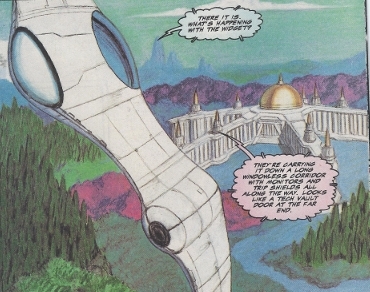 The estate, which Sinjin Quarrel jokingly noted must have room for half of Bovric's population, was located somewhere between the (or at least "a") spaceport and the town of Paka's Crossing. The estate's defenses included fighters. A notable location within the estate was the Jamhook vault. The wing of the estate containing the Jamhook vault was destroyed by a massive meteroid created by Sinjin Quarrel (soon to be Starlord)'s Element Gun and guided to fall from orbit to that location by Ships' Gravifex beams. When unfamiliar vessels approached Damyish's estate, a trio of fighter ships would take to the air, firing lasers and/or rockets to blast any unwelcome visitors out of the air. Damyish had a massive vault containing apparently thousands of files with information with which he might blackmail other people; the list of people extended beyond Bovric and beyond the Carinian Cluster itself. The wing of the estate containing the Jamhook vault was destroyed by a massive meteroid created by Sinjin Quarrel (soon to be Starlord)'s Element Gun and guided to fall from orbit to that location by Ships' Gravifex beams. Only three such files, including the one containing information on Viz Glazgon, survived the destruction.